Want to be entertained and inspired at the same time? 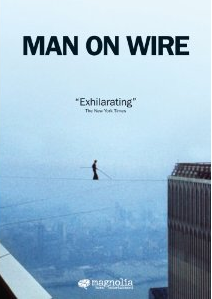 Watch the Oscar-winning film, Man on Wire. I usually forget a movie shortly after watching. However, Man on Wire is well… unforgettable. It’s exceptional. I was thoroughly moved and motivated by the passion of tightrope walker, Philippe Petit, who decides he’s going to erect a rope and walk between the NYC World Trade Center twin towers. I admire him for his passion and for his ability to execute his plan. Go for it! Feel the fear and do it anyway. Have you ever let someone talk you out of a dream because it seemed impossible? 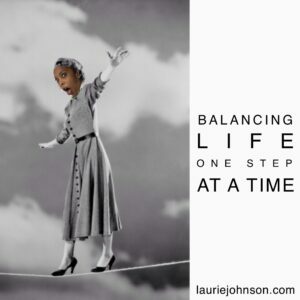 Which of one of your dreams do you need to reconsider? I’m hyper, don’t have TV, and enjoy making all my own blog graphics. Join the millions (yes, millions) who receive my irregular and infrequent newsletter. click here to get yours. i tap. i talk. i tweet. get my free monthly newsletter.